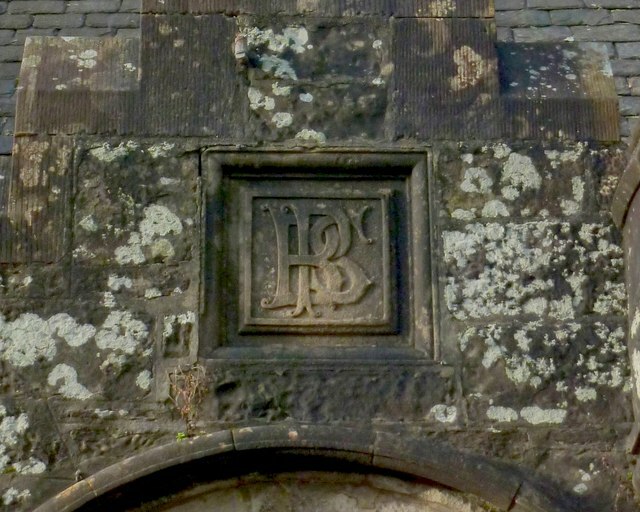 This detail appears above the door of the lodge; see NS3882 : South Lodge of Cameron House for a view of the whole building; the door and this detail are visible in that picture. "Debrett's Illustrated House of Commons, and the Judicial Bench" (1867), on page 214, gives an account of the above P.B.Smollett, concluding with "Seat – Cameron House, Dumbartonshire", confirmation that the monogram shown here does refer to him. Other details on the lodge include the Smollett coat of arms, and the family's crest: see NS3882 : South lodge: coat of arms above window and NS3882 : South lodge: crest detail.